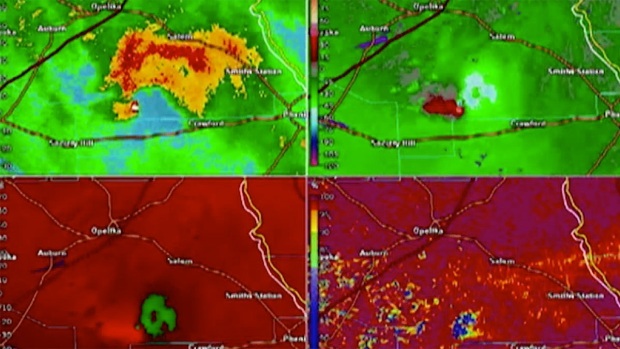 The image from NOAA at left shows a portion of a tornado warning for Alabama issued at 1 p.m. CST on Sunday, March 3, 2019, before a tornado hit later in the day. At right, Cindy Sanford sifts through the debris on Tuesday while retrieving personal items after the tornado destroyed her home in Beauregard. Predicting with any precision where a tornado is going to go is still beyond the limits of meteorology, which is why warnings went out for a large two-county area when a tornado might be only half a mile wide. Sometimes in forecasting tornadoes, you can get everything technically right, and yet it all goes horribly wrong. 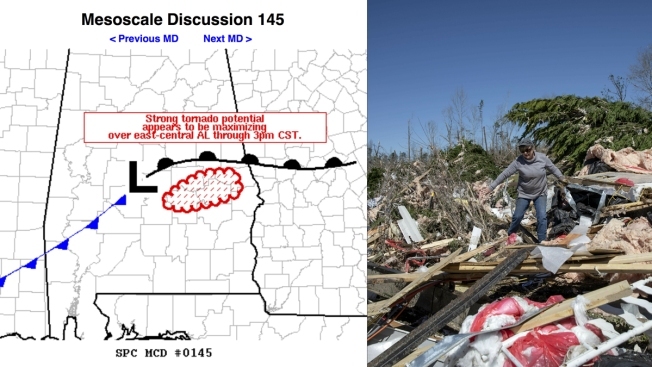 Three days before the killer Alabama tornado struck, government severe-storm meteorologists cautioned that conditions could be ripe for twisters in the Southeast on Sunday. Then, an hour before the tragedy, they warned that a strong tornado could occur in two particular Alabama counties within 30 to 60 minutes. A series of tornadoes ripped through eastern Alabama late Sunday night, leaving 23 people dead and homes and businesses reduced to rubble. The search for more victims, missing pets and belongings in and around the devastated rural community of Beauregard continued Tuesday amid the din of beeping heavy machinery and whining chain saws. To a meteorologist, the forecast was the equivalent of a hole-in-one in golf or a slam dunk, but with so many people killed, "was it a success or a failure or both?" asked Colorado State University meteorology professor Russ Schumacher. Forecasters "painted a pretty clear picture that something bad was going to happen," Schumacher said, and "there's certainly success in that. On the other hand, we don't like to see entire communities to be turned upside-down like this. So there's more to be done." Predicting with any precision where a tornado is going to go is still beyond the limits of meteorology, which is why warnings went out for a large two-county area when a tornado might be only half a mile wide. And getting people to listen and take precautions is another matter altogether. Forecasting tornadoes combines the hard physics of meteorology, the softer human factors of social science and more than a dash of chaos. At the National Oceanic and Atmospheric Administration's Storm Prediction Center in Norman, Oklahoma, forecasters look for certain ingredients that can make a tornado. These include warm moist air coming from the south and stormy weather chugging from the west that can bring instability. That's when you can get supercells, which is where tornadoes come from. But maybe only 10 to 20 percent of supercells spawn tornadoes, said prediction center forecast operations chief Bill Bunting. There are other factors at work, including erratic wind behavior known as wind shear, the amount of cold air present, even the size of the rain droplets, meteorologists said. And then there are the unknown factors at play. 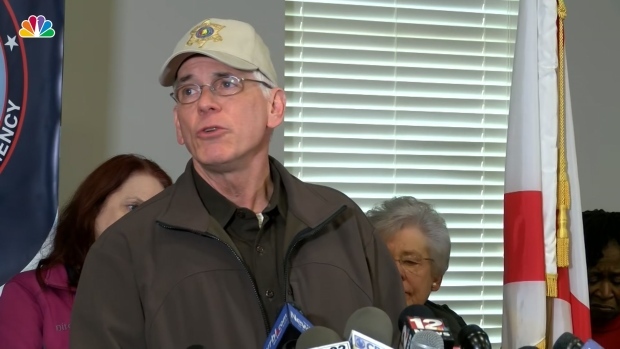 Lee County Sheriff Jay Johnson and Chris Darden of the National Weather Service address the media after a tornado swept through the region over the weekend, leaving at least 23 dead and dozens more unaccounted for. Given all that, the best meteorologists can do is say seven to eight days out — four to five is more usual — when conditions will be ripe for tornadoes, Bunting said. And even that doesn't mean they will happen. And certainly not over all of the large area that meteorologists give in their several-day-out alerts. From 1994 to 2017, the weather service's "false alarm" rate for tornado alerts was 74 percent, while last year it dropped to 69 percent, according to weather service spokeswoman Maureen O'Leary. The problem is that a tornado is a rare, small, fleeting event, harder to predict than giant phenomena like hurricanes or big winter storms. A one-mile variation in a tornado's path can mean the difference between plowing up a field and wreaking havoc in a populated area, Bunting said. Bunting's office might warn people to watch out across a five- or six-county area or even a two- or three-state region, but "only a very, very small area of that risk area will actually experience dangerous conditions," he said. And people who don't get hit may not bother to listen the next time, said University of Oklahoma meteorology professor Howard Bluestein. That's the social problem, which may be even bigger than the meteorology one, Bluestein said. And that's where Kim Klockow-McClain comes in. She is a researcher for NOAA's National Severe Storms Laboratory , also in Oklahoma, who specializes in trying to find out why some people listen and react to warnings and others don't. 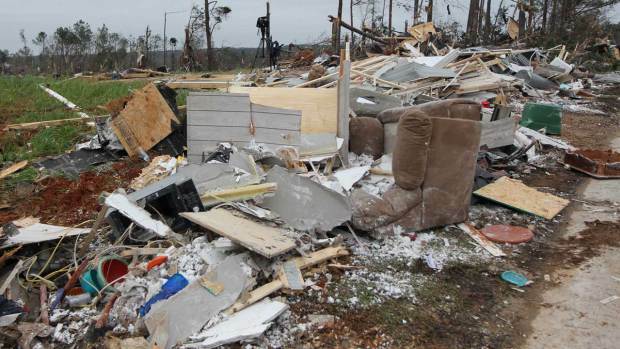 At least 23 people were killed when a tornado struck southeast Alabama on Sunday afternoon. Alabama Gov. Kay Ivey declared a statewide emergency after the storm. "Social sciences, I think, are really going to the heart of the issue," Klockow-McClain said. "You've got to receive the message. You've got to understand it and know what to be able to do about it." For example, people in mobile homes, which are especially vulnerable to tornadoes, are less likely to receive or seek out storm alerts, she said. Even though they are told to get out, studies show mobile home dwellers still "shelter in place," Klockow-McClain said. "They think it's the best thing they can do or the only they can do." The weather service started to change from just focusing on better forecasts to better communication of warnings in 2011 because the agency noticed that the forecasts had improved but that the outcomes were still similar to what they were in the 1950s, '60s and '70s, she said. Donate to the United Way of Central Alabama's Lee County Disaster Fund. The organization says 100 percent of your donation will be sent to United Way of Lee County to help those in need. For more information, visit this website. Donations to the Red Cross Disaster Relief fund can be made at Redcross.org or 1-800-RED-CROSS. Donations can also be made to the Red Cross of East Alabama. The Alabama Governor's Emergency Relief Fund, created after hurricanes Ivan and Katrina hit the region, supports individuals and families recovering from natural disasters and severe weather in Alabama. More information here. 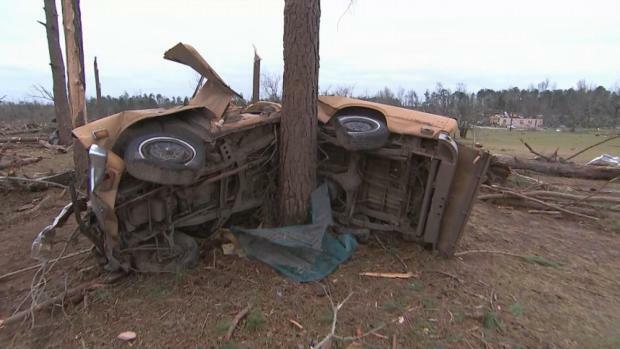 At least 23 people are dead and more are injured after a tornado struck southeastern Alabama on Sunday. Crews are still searching for more dead and wounded.